The views from the Pinnacle stretch out across Galls Gap and beyond (image © Paul Brownbridge/Peak Multimedia). Summer months in the Grampians mean lazy days by the lake sipping on a cold, crisp glass of Riesling. 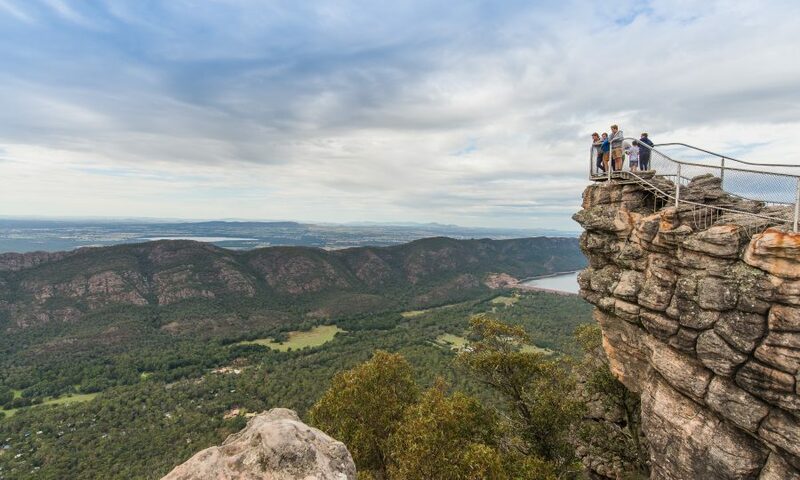 What’s on during December, January and February in the Grampians? We’ve got you covered. Book your accommodation in Halls Gap and enjoy the best the Grampians has to offer this summer. The Grampians Music Festival is held in Halls Gap features a range of music acts. But you need to get in quick! To ensure the festival is an intimate event, as well as limiting impact on the natural environment, the music festival is limited to just 2,500 tickets. For more information on the Grampians Music Festival click here. The Grampians hosts a popular hot rod event known as Rod Run (aka the Old Skool Hot Rod Event). A hit with car lovers the event also has an amazing range of cars and hot rods on display. Local and international visitors enjoy a fun-filled day at The Seppelt Salinger Great Western Cup; one of the most-admired horse racing events in Australia. For children, the Great Western Cup offers a wide array of amusement options, including live music, delicious food and numerous activities. Good luck! Hope you back a winner. The Willaura Farm to Pub brings together the local community and visitors who take part in a 5 km walk, 8.2 km run/cycle or a 16.4 km run/cycle. Buses depart from the Willaura pub to take runners to the start line. Competitors can sign up on the day, but make sure to be at the pub one hour before the race start time. The 5km course is on a sealed road and is suitable for prams and wheelchairs. After the race, everyone comes together for a meal and a drink at the pub. There is often live music and activities, such as a jumping castle, for the kids to enjoy. Since 2007, money raised from this event has gone to Beyond Blue. 5. Get on your bike! The Grampians offers fantastic road cycling. Two of the more challenging routes are the climb up Mt William which as about 13kms (a good warm up) and Boroka Lookout. Both rides are featured and recommended by The Climbing Cyclist. Cool nights during the growing season guarantees great acid tension and Rieslings from the Grampians region are known for their distinctive combination of slate and lime. And it’s not all about the Rieslings, only minutes away from Halls Gap is Fallen Giants at Halls Gap Estate Vineyard offers some of the best shiraz in Australia. Visit the cellar door for wine tastings or settle in with a bottle of wine and cheese platter. Now that’s what summer is all about. Visit the Halls Gap Zoo, they are Victorias largest regional zoo featuring over 160 species including our new African Rhino. Treat the family to Grampians Adventure Mini-golf. Play a round of golf at the Halls Gap Golf course. The course is 3,143 metres long and boasts spectacular views of the Grampians Mount Difficult and Wonderland ranges. Play amongst snakes, kangaroos, emu, deer and lots of native bird life which frequent the course. Caution: yes there are snakes out this time of year! Serenity Halls Gap Accommodation is a great base to explore the Grampians and enjoy many of the summer events on offer. But you do need to get in quick! Accommodation books quickly – sometimes 12 months in advance for the most popular events.